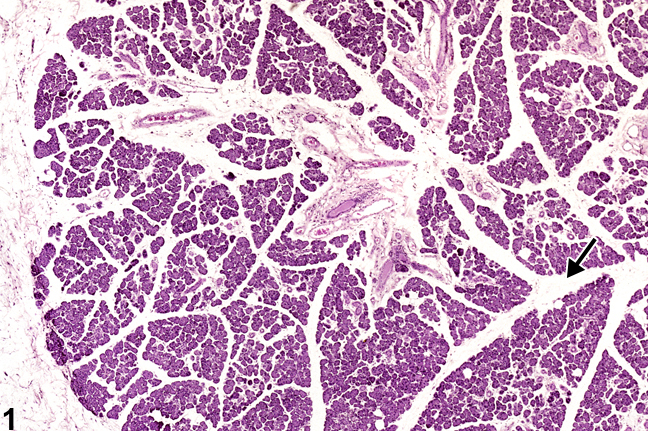 Salivary gland - Edema in a male F344/N rat from a chronic study. The clear space between the lobules (arrow) is evidence of edema. Edema in the salivary gland is characterized by separation of the glandular tissue by clear space or eosinophilic fluid. Edema fluid is often lost at processing and therefore appears as clear spaces in tissues ( Figure 1 and Figure 2 ). If the edema fluid is not washed out, it will appear as homogenous eosinophilic material in the interstitium. Edema is the result of alteration in any of the factors that regulate normal fluid distribution between the plasma, interstitium, and cells such as increased vascular permeability, increased intravascular hydrostatic pressure, decreased intravascular osmotic pressure, and decreased lymphatic drainage. It has been suggested that the mechanical administration of test materials into the salivary gland may provoke local tissue damage, edema, and deranged salivary outflow leading to secondary inflammation and occasional secondary bacterial infection (from resident oral bacteria). Another possibility is that a decreased salivary outflow results in interstitial leakage of salivary proteolytic enzymes and causes local tissue damage. 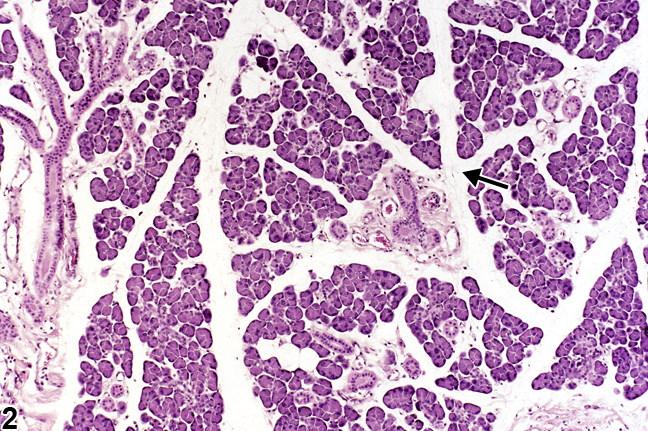 Edema occurring in the absence of other evidence of inflammation should be diagnosed and graded based on degree of separation of parenchyma by edema fluid and extent of the lesion within the salivary gland. When edema is part of an inflammatory process, it should not be diagnosed separately but should be described in the pathology narrative as a component of the inflammation. Elmore S, Lanning L, Allison N, Vallant M, Nyska A. 2006. 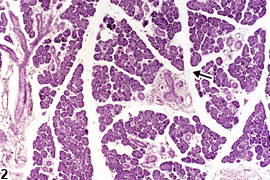 The transduction of rat submandibular glands by an adenoviral vector carrying the human growth hormone gene is associated with limited and reversible changes at the infusion site. Toxicol Pathol 34:385-392. Mosier DA. 2007. Vascular disorders and thrombosis. In: Pathologic Basis of Veterinary Disease, 4th ed (McGavin MD, Zachary JF, eds). Mosby, St Louis, MO, 63-99.